Wow!! 20 million - that's a lot of donuts and coffee. Too bad Tim Horton wasn't able to enjoy any of those spoils. Ron Joyce, the former owner of Tim Hortons has put his luxury super yacht up for sale. But it looks like he 82-year-old billionaire is prepared to take a bit of a bath on it — at least $10 million. Ron Joyce made a lot of money on coffee and doughnuts. But he’s sailed into choppy waters when it comes to his 49-metre luxury super yacht. The former owner of Tim Hortons has put his yacht Destination Fox Harb’r Too up for sale. And it looks like he 82-year-old billionaire is prepared to take a bit of a bath on it — at least $10 million. He paid more than $30 million in 2008. And now he has it up for sale for $19.95 million with Fort Lauderdale-based yacht brokers Northrop and Johnson. It’s been up for sale for more than two years, first with a $29.5-million asking price, lowered to $24.9 million before being cut again to the current price tag. The yacht has also been available for rental, at $230,000 per week for charter vacations. Contacted Monday about his yacht sale plans, Joyce was reluctant to discuss them. He had other yachts but they’ve all been sold, he said. 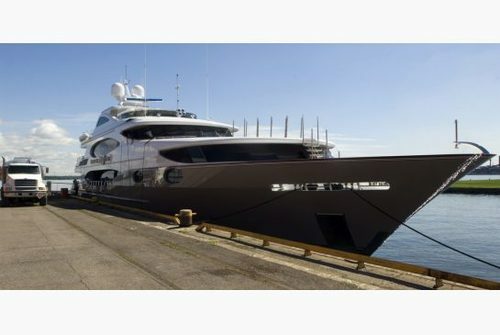 Asked about the gap between what he paid and the current selling price, Joyce said he recognized the yacht was for fun, not profit, when he bought it. But he believes losing one-third of the value in five years would be unusual. They tend to depreciate much less than that, he said, even in a sputtering economy. Yachts that are less than 30 metres in length, he said, tend to ride economic waves when it comes to pricing. But bigger yachts are generally recession-proof, catering to people who have money to burn, no matter what the economy dictates. “Sometimes a guy will make $300 million in a deal and he suddenly wants a yacht to go cruising. Price is no object,” he says. To such a person, a used super yacht is appealing because he could avoid a three- or four-year wait for a new one to be built. But it seems with Joyce’s yacht, such a buyer has yet to come along. The boat was christened in the Gulf Coast five years ago and passed through Halifax before arriving in Hamilton later that year to scores of curious onlookers. The Destination Fox Harb’r Too has two Caterpillar diesel engines with more than 2,000 horsepower each, a range of about 2,500 nautical miles on a full tank of fuel and a cruising speed of 17 knots (about 19.5 mph or 31.5 km/h). The yacht had a full-time crew of 10, including a gourmet chef. Joyce, a former cop, was a Morse code operator in the Royal Canadian Navy. During his navy career, he sailed the world and did a stint in Korea on the destroyer HMCS Iroquois. Everywhere I go I see "land yachts" up for sale. 10's of thousands of dollars are lost living the RV dream every year, expensive to buy, to keep and to dispose of after use. I know, I was one of them.